Offering an above-average display and good graphics performance, the T-Mobile SpringBoard jumps into the mix of 7-inch tablets. Made for T-Mobile by Huawei, the SpringBoard joins Samsung's Galaxy Tab 7.0 Plus and Galaxy Tab 10.1 4G in the carrier's lineup of HSPA+ tablets. Although the SpringBoard's up-front cost seems reasonable--$180, as of November 7, 2011 (with two-year contract)--its price over the long haul will make a bigger dent in your wallet than you may expect. That $180 is actually what T-Mobile refers to as a “down payment”; you must also make 20 monthly $10 payments, for a total cost of $380 (including T-Mobile's $50 mail-in rebate). Still, if you're angling for a tablet with mobile broadband, this Android 3.2 Honeycomb model is a solid bet. The SpringBoard is relatively compact, though it's neither the smallest nor the lightest 7-inch tablet I've seen. Measuring 7.48 by 5.08 by 0.41 inches, it looks eerily similar to HTC's Flyer, with a more streamlined profile that makes it easier to hold. Both tablets have a silvery metallic backing with white panels at the top and bottom; however, the bottom panel on the SpringBoard pops off (after much difficulty and fussing) to provide access to the MicroSD card slot. 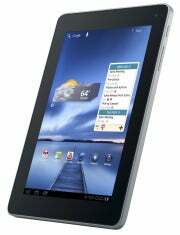 The tablet weighs 0.88 pound, the same as the upcoming Toshiba Thrive 7” Tablet and the Barnes & Noble Nook Tablet. That weight feels reasonable for one-handed operation, though a tablet that shaved off even more weight would be truly comfortable to curl up with for long reading sessions. At least the display is attractive and conducive for reading. The SpringBoard is among a new crop of 1280-by-800-pixel 7-inch tablets. Toshiba's Thrive 7” and Samsung's announced-but-not-shipping Galaxy Tab 7.7 (which is 0.7 inch larger than the SpringBoard or Thrive) both sport 1280-by-800-pixel screens. The extra pixels make a difference: Text on the SpringBoard looked smoothly rendered and sharp, and lacked the pixelation I've come to expect from tablets. Images seemed sharp, too, with crisp detail visible. The tablet deftly handled our test suite of images, showing distinct and well-balanced color separation on our color-bar chart, better-than-average contrast, and excellent detail in our gymnastics photo. Holding back the SpringBoard, however, was its rendering of text captured from a Web page--in part because that image, like all others, rendered in a smaller size on the SpringBoard than on other tablets we've tested, due to the screen's higher resolution. One other concern involved the SpringBoard's video playback. It played the video smoothly, with good contrast and detail, producing better results than our best 7-inch performer to date, the HTC Flyer. But the audio was disappointing, coming across too soft and inadequate through the built-in stereo speakers. Even so, the SpringBoard was among our top scorers in our display tests overall. This is the first Huawei tablet we've tested, and from the looks of things, the company has stepped up its game, improving over the early tablet iterations it showed off at CTIA in March. This model, available elsewhere in the world as the Huawei MediaPad, looks and feels better constructed than previous Huawei tablets we've seen. The SpringBoard is the same, physically, as the MediaPad, but it has T-Mobile branding, a customized software load, and a 4G radio. The SpringBoard has just two buttons along the right side (when you hold it in portrait mode): a sleep/wake/power button, and a volume rocker. But those buttons are nicely formed and feel good to the touch. Inside the tablet are a dual-core 1.2GHz Qualcomm Snapdragon MSM8260 CPU, 1GB of memory, and 16GB of storage. Those components provided enough oomph to power the SpringBoard to above-average performance in some of our tests; it was one of just a handful of tablets (at this writing) to generate more than 30 frames per second on our OpenGLBenchmark 2.1 test. My early test unit showed an odd lag when I transitioned between screens, rotated orientation, or moved among media; the company says that these visual artifacts and jerky behaviors should be fixed in the final software load, which I'll be trying within the next day. The included 16GB of storage is standard for tablets in the $350 to $400 price range (which the SpringBoard falls into when you take into account its full cost). But that amount of space is generous given that this model is intended to compete against low-cost, non-mobile-broadband tablets such as Lenovo's contract-free $200 IdeaPad A1, which has just 2GB of memory and a lower-resolution screen. If you crave more storage, you can add it, but only if you're willing to put in some work. The tablet has a MicroSDHC Card slot for adding up to 32GB of storage, but as mentioned earlier, the flap is difficult to remove. T-Mobile says that it has seen units on which removing the flap got easier with time--or wasn't difficult at all. But ultimately the design of that flap is just plain awkward. The SpringBoard has a 5-megapixel rear-facing camera and a 1.3-megapixel front-facing camera. (PCWorld's camera testing is still pending, as are our battery life tests.) Along the bottom are power, Micro-USB, and Micro HDMI ports; the stereo speakers, oddly, both sit on the top of the tablet (in portrait mode) or the left. The speakers output reasonably solid-sounding music audio--though I had to pump the volume to the max to achieve that result, and to make the music loud enough for enjoying in a small room. The audio that accompanied our test video sounded woefully inadequate. The disparity in quality makes me wonder how much of the audio pros and cons are due to software, as opposed to the hardware's capability. This is the first tablet I've seen to bring SRS audio controls to the front and give the user options right on the quick-settings menu. SRS is enabled by default, and the feature clearly made a difference in the audio quality, bolstering the audio to produce noticeably more full-bodied, if not louder, sound. Without SRS on, the speakers sounded weak and tinny. I found the speakers' positioning odd, too; having both speakers sitting on the same side of the SpringBoard mitigated the stereo effect, and when I held the tablet with both hands in landscape orientation, my palm blocked one of the speakers. T-Mobile loads the SpringBoard with a slew of apps to get you started, including Blio eReader, Blockbuster on Demand, Cozi Family Organizer, Netflix, Slacker Radio, and T-Mobile TV. Also on board is TeleNav's GPS Navigator for turn-by-turn directions. 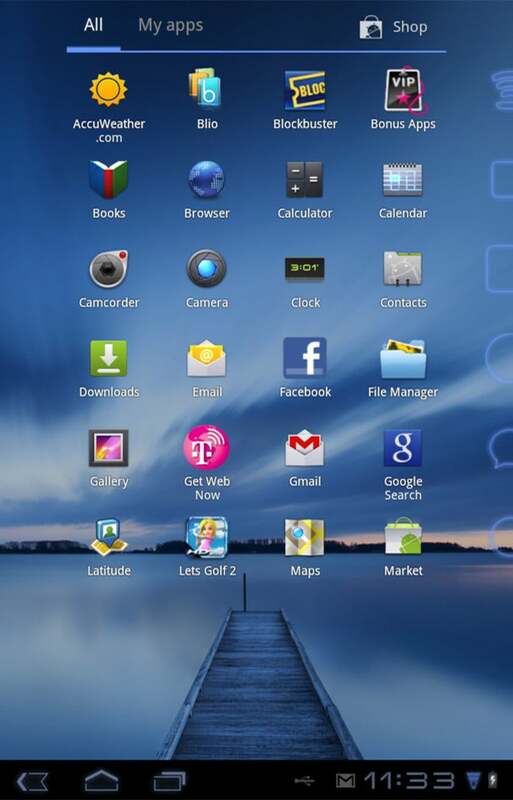 The interface is a mostly garden-variety take on Android 3.2, with a few tweaks. T-Mobile provides its own keyboard from Swype; I found it easy to use and responsive, with convenient multipurpose keys that are better defined than those of the stock Android keyboard but cluttered with secondary characters. I particularly liked the ability to reduce the size of the keyboard to mimic what's on a cell phone; some users may find the smaller keyboard more comfortable for thumb-typing with one hand. Other tweaks include the ability to close out of open apps showing in the recently accessed app scroll; you can also move the screen-rotate and SRS-audio options higher in the settings pop-up. T-Mobile's data plans start at $30 a month, with a $10-per-month discount for existing voice customers. That pricing includes using the tablet as a mobile hotspot, for up to five devices. This lightweight, compact, high-resolution model is the only one on the chart that's sold exclusively through a mobile carrier. But it's worth a look if you want a connected, portable Android tablet.